Another brand released the limited holiday collection. 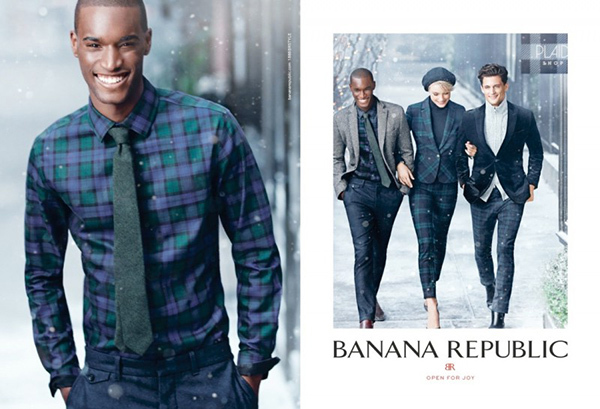 Banana Republic decided to create a catchy photoshoot and tapped two models simultaneously. Wise decision, taking into account the impression that the ladies create. I love such holiday editions, for they usually contain a very specific message and bring a special mood. Both excitement and joy overfill my busy brain and there is nothing else except for these images that I want to stare at. I am sure you will share my feelings, so read on to find out more about the line itself as well as the beautiful muses. 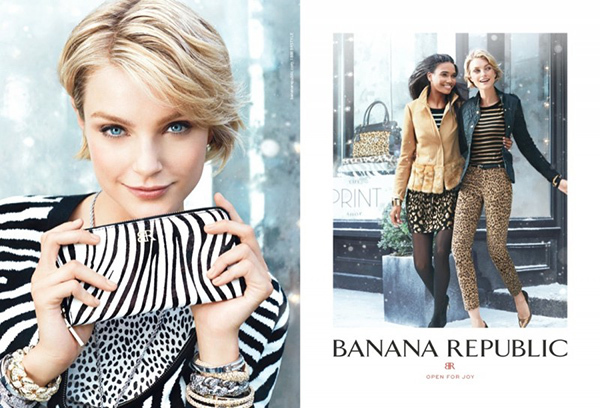 Arlenis Sosa and Jessica Stem star in the campaign for Banana Republic. I adore the effortless way the ladies pose, showing off an excellent mood and superior clothes. They were also accompanied by a male model who added to the overall impression. Norman Jean Roy lensed the trio on the snowy streets creating an immediate link to Christmas and New Year Eve. Time passes so fast that you won’t even notice how soon you will be invading the gift shops. 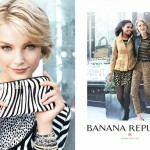 As one of the options, you may choose the outfits by Banana Republic: I am sure anyone will love such a present. A little bit about the starring beauties. You might be familiar with Jessica Stem, however I will still introduce her. Can you imagine that this talented model was raised on a farm in a family with 7 children? I have always wondered what it feels like to have so many siblings. Surely, very exciting, yet quite noisy. She was scouted at the Canadian amusement park by a recrouter from a modeling agency to be offered a contract right away. The jewels like her can’t stay unnoticed after all. Today she can be proud of herself. Jessica walked runways for Miu Miu, Marc Jacobs, Dolce & Gabbana, Dior, Prada, Atsuro Tayama, Emporio Armani, Roberto Cavalli, and Bulgari. She has also worked with such photographers as rving Penn, Mario Testino, Peter Lindbergh, Craig McDean, David Sims, Paolo Roversi, Inez & Vinoodh, Vincent Peters, Juergen Teller, Thomas Schenk, Michel Comte, Glen Luchford, Terry Richardson, Nick Knight, and Richard Burbridge. Arlenis looks totally different. I assume, this was the inteniton of the creative director: to create a contrast, something that would catch the customer’s attention. And it surely did. I keep staring at both of the models trying to decide on the one I like the most. But in reality it is impossible to compare them. The ladies look incredibly disticnt and this adds a specific zest to the line. Arlenis Sosa is from Montecristi, Dominican Republic. The beauty has a story worth of a being published. She might be called a modern Cinderella, as what’s happening to her now is nothing less than a miracle. She was recommended to start a modeling career at the age of 16. Fashion designer and her family’s close friend Luis Menieur suggested she could go to New York and start up a new path. Although, the girl has no English at that time, she somehow managed to communicate and take part in a runway show. Since then she has been starring in a number of shows, editorials and photoshoots. 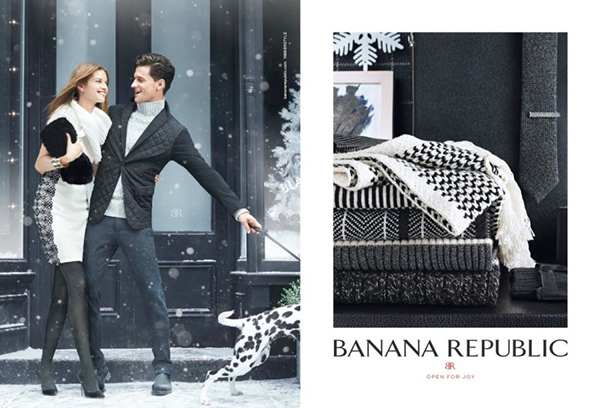 Banana Republic Holiday 2013 campaign is worth being checked out. Enjoy more photos of the ads to get this Christmas mood deep in your heart and soul. The images also bring a different image: instead of sitting in your office, have some fun outside the boring walls.